Live the ultimate Percy Jackson adventure on this 7-day enthralling tour of Greece’s most important sites. Explore the lands where the gods and beasts of Greek mythology lay waiting for you to discover them. Join our 7-day mythology adventure and follow Percy Jackson’s trail around Greece! Experience seven days of family fun and see for yourself the temples of Olympian Gods across the country, famous archaeological places that Percy Jackson and his friends lived their adventures, secret mythology spots and many more Percy-Jackson hotspots! From the Acropolis and Delphi Oracle to Daedalus’ Labyrinth, your journey will be full of myths, secret tales and real-life Percy-Jackson places that will blow your mind! I’ve booked the Percy Jackson Tour and it was fantastic, everything was perfect,as mentioned in the offers sent to me by Nikos who organized the tours. Excellent tour guides providing us with helpful information and well-organized timetable made it one of the best vacation in my lifetime!Special thanks to Nikos for his great work, kindness, and support, as he is so professional .Definitely the best way to get to know Greece, especially if you have children. We did the full private 7-day 'Percy Jackson' (i.e., classical Greece and earlier, with a focus on archeological sites, history, and myths/legends/the gods), with a 9-year old, his parents, and his granddad -- the Acropolis, Sounion, Delphi, ancient Corinth, Epidauros, Mycenae, Napflio, Heraklion [Crete]). It was simply amazing -- everything ran smooth as could be, the hotels were fantastic, the trip back in time from classical Greece to the Minoans was amazing. We had three different guides, one for each leg of the trip, and they were all, in their own way, excellent, and went over and beyond the call of duty to keep our son engaged and answer all of his dad's myriad questions. We also appreciated the swift yet deep guidance through the museums, and the easy getting ahead to the front of the lines, as well as the insider tips for restaurants and things to explore on our time off. The pacing was excellent too -- a perfect mixture of sightseeing and relaxation, with easy and well-placed transfers. These folks got this trip down to an art! We took our 12 year old grandson for a Percy Jackson mythology tour and we had a great time. GreekingMe did a wonderful job and we could not be more pleased. Since this was our grandson’s trip we wanted him to be happy and I can say that he was! All of our guides and drivers were very knowledgeable and professional. GreekingMe accommodated our personal wishes to see a site not otherwise on the tour schedule. If you want to tour Greece you should definitely have GreekingMe plan your tour. Your mythology 7-day trip will take you on a family Percy-Jackson quest around Greece! You will visit the most important archaeological sites connected with Greek Mythology and the adventures of Percy Jackson. The whole trip is private and can be customized according to your preferences! Private transfer from the airport to your hotel will be arranged at the time of your arrival in Athens. You are free to relax and see the city at your own pace during the first day. Take a walk around the city center, stroll in Syntagma square and the National Garden or eat in a small eatery in Psirri neighborhood. However, if you are the kind of a restless family and you want to explore the city further, we can recommend a wide variety of family activities led by our family-friendly guides! Opt for our Athens family food tour and discover the best Greek food in the city! Explore Athens central market, eat traditional dishes like moussaka and satisfy your sweet tooth with delicious Greek desserts! If you prefer a more interactive food activity, join us in our Athens cooking class for families and cook traditional Greek recipes on your own as shown by a family-friendly chef! Your kids could also play and learn about Greek Mythology, its heroes and mythical creatures in Ancient agora: a really fun activity led by expert educators! If your family is really adventurous, play in our Athens Kid-friendly treasure hunt and explore the city in the most creative way! Your Percy-Jackson adventure is ready to set out! Fuel up with a good breakfast and let your journey begin in the very Acropolis Hill! Walk up the sacred rock and give time to yourself to relish your first step on the marble stairs leading to the main site of Acropolis through the gate of Propylaea. Admire the towering columns and the unique ceiling of this ancient gate and next minute find yourself to stare at the mighty Parthenon! This is the temple dedicated to Goddess Athena Parthenos – the patron of the city during antiquity – and the very battlefield of the last combat in the “Blood of Olympus”. Your guide will take your kids on a mythical journey with stories and talesinterwoven with Acropolis and all its masterpieces! Every marble and cobblestone of the site hides a truth ready to be discovered! Fancy upgrading your Acropolis experience? Opt for our Acropolis 3D tour and time-travel through a mini i-pad to witness the ancient vividness of all the masterpieces in the archaeological site! 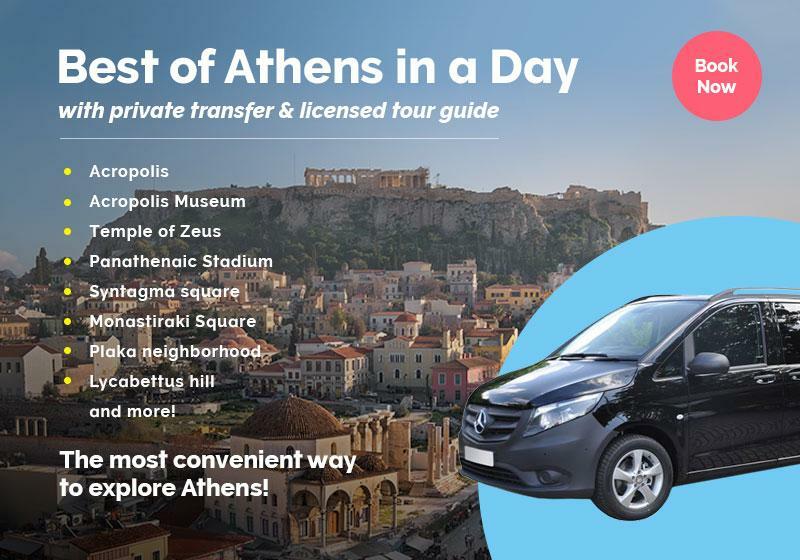 Your next stop will find you at the Acropolis Museum! You will get to explore a 21st century international museum with a range of facilities: a beautiful restaurant, a café, a museum shop, a reading lounge and a lab, where you can learn more about Acropolis interactively! Your kids will be fascinated by the almost 4000 artifacts of the museum and the statues of the Olympian Gods.Your family-friendly guide will enlighten you with stories about the Gods of Olympus and the museum exhibits that will amaze both your children and yourself! Don’t forget to notice the glass floor at the entrance of the museum and see an ancient Athenian settlement just below your feet! After your three-hour tour finishes, you will take time to relax and have Greek lunch in a cozy restaurant nearby. Alternatively, you can choose to lunch in a fish tavern by the sea, since our trip to Sounio comes next! Rise and shine early in the morning to go for a venture in the mystical town of Delphi! We all remember the Oracle’s prophecies that led Percy Jackson and his friends into great adventure! Delphi, home to the Great Oracle and a UNESCO World Heritage Site, is situated on an inspiring spot amidst the hills of Mount Parnassus. It used to be the great Oracle of the antiquity that people from all over Greece came to consult on any important matter. Visit the archaeological site of Delphi and relish magnificent views of the Phocis valley and the Corinthian Gulf. You can explore this ancient town and see the Temple of Apollo, the Treasury of Athens, the gymnasium and many other ancient facilities that hosted great rituals and athletic games in antiquity. Discover how Gaia, the primordial deity that fought with Percy and his friends in the “Blood of Olympus”, was connected with the Oracle of Delphi! Do you know who really Pythia was and how she managed to foresee the future? The ancient town of Delphi has many stories to tell and your family-friendly guide will fascinate your kids with exciting myths! After being “initiated” into the mystical energy of Delphi, you will be dropped off at your hotel in Athens for some rest till next morning comes! Ancient Corinth, home to many myths and stories, comes next in your Percy Jackson adventure! Wander around the archaeological site of the ancient town and unfold intriguing stories about God Poseidon and his insatiable hunger for power! Do you remember Jason and the Argonauts? Ancient Corinth is one of the places that Jason lived after his quest for the Golden Fleece; find out everything about his relationship with Medea, the powerful sorceress, and the horrific things she did out of her love for Jason! You will also get the chance to visit Acrocorith, the acropolis of ancient Corinth. Ascend the hill and discover a strategically built acropolis along with breathtaking panoramic views! You will see the remains of Aphrodite’s Sanctuary, the Greek Goddess of Love, and hear many tales about this place; from the Pirene fountain to the mythical Pegasus, Acrocorinth is full of hidden stories! Welcome to Epidaurus, home to famous Asclepius and one of UNESCO World Heritage Sites. Asclepius was the God of Medicine and Percy Jackson fans will definitely remember his deus-ex-machina role in the “Blood of Olympus”. During your stroll around the archaeological site of Epidaurus, you will discover the famous Theatre of Epidaurus, the best preserved theatre of ancient Greece. Popular for its great acoustics, this beautiful open-air theater is still in use nowadays and hosts grand performances! Step into Asclepieon, a healing temple in the antiquity dedicated to the God of Medicine. The sick used to visit Asclepieon seeking for either physical or spiritual treatment. Uncover all the hidden stories of that place and the myth behind God Asclepius. You will also get to see a temple dedicated to Artemis, the Goddess of Hunt, along with facilities of a proper healing center, such as baths and the gymnasium. When your Percy Jackson day adventure finishes, you will get to your hotel at Mycenae, where you will spend the night. Behold the Royal Palace of Mycenae, the kingdom of Agamemnon, the mighty ruler! After your energizing breakfast, you will head to the archaeological site of Mycenae. Ancient Mycenae was the kingdom of Agamemnon, the leader of the Greeks in the Trojan War. Find out everything about the backstage of the Trojan War, beautiful Helen from Sparta and Pares, her lover. So many myths and juicy stories hidden around Mycenae that your kids will be utterly fascinated! You will get to see the magnificent Lion Gate of the palace and the legendary Cyclopean walls; who built these towering walls according to legend? Visit the Treasury of Athens and unfold stories about famous heroes and other mythical warriors, such as Achilles. Experience a legendary journey through time to meet grand warriors and heroes! Get ready to meet Nafplio, the most romantic town in Greece. When your mythical quest in Royal Mycenae ends, you will visit the nearby town of Nafplio to unwind with relaxing strolls around town. Visit the castles guarding the town - Acronafplia, the Venetian Castle of Palamidiand the castle of Bourtzi – and relish magnificent seascapes from different angles! Your family guide will take you through hidden alleys, show you beautiful tucked-away shops and reveal secret stories about the town. You will also devour a rich lunch and taste the most delicious ice-cream in Nafplio! Feeling a little tired or fancy more adventure? Whatever your mood is, choose between a horse-riding experience and a relaxing Greek massage (upon request)! Welcome to Ancient Olympia, the birthplace of the Olympic Games! Ancient Olympia was the very place that the concepts of fair play and athleticism were born. Wander around the archaeological site and witness an ancient sports center with a running track, a gym, locker rooms, baths and even a hostel to accommodate VIP guests. Admire the temple of the mighty Zeus who was the god honored with those athletic competitions; this is the place where the famous Statue of Zeus, a masterpiece of the 7-wonders family, used to stand overlooking the athletic contests. You will also discover the religious nature behind the Olympic Games and intriguing fun-facts about this ancient competition; don’t miss the chance to check out the spot where the Olympic torch was lighted! Ready for a quick race? Outrun each other in the original Stadium where Greek athletes competed thousands of years ago! Time to visit the Palace of Knossos in Crete where the throne of King Minos rests! After a short drive through Heraklion, the mini-van will set you down outside the archaeological site of Knossos. You will get to see the most important site of Minoan civilization, a place inhabited since 7000 BC. Wander around the archaeological site of Knossos and marvel the famous fresco of the “Prince of the Lilies”, the Queen’s Hall and the very throne of King Minos! Do you remember when Annabeth and Percy found an entrance to Deadalus’ Labyrinth in the “Battle of the Labyrinth”? Can you recall who Ariadne and the Minotaur were? During your quest in Knossos, you will find out where Daedalus’ Labyrinth is said to be and uncover fascinating stories about the ferocious Minotaur! After your intriguing quest for Percy Jackson spots in Knossos Palace, you will visit the Archaeological Museum of Heraklion. As it accommodates unique exhibits from all over Crete dating back to the prehistoric Minoan period, the museum is considered one of the most important in Europe. Your guide will show you around and you will see the artifacts “coming to life” with illuminating stories of the Minoan past. Marvel classic Hellenic and Roman sculptures, wall-paintings, unique jewelry and the most mysterious exhibit of all, Phaestos disc – bearing a still puzzling inscription for the archaeologists worldwide. An utterly fascinating experience! When your Percy Jackson quest finishes, unwind with a relaxing walk around Heraklion city center. Your family guide will take you through small alleys, tucked away laneways and the most vibrant spots of the city! You will discover the most historical places of Heraklion and its distinctive landmarks, along with the best places to eat and hang out with your family! Dikteon Cave welcomes you to its imposing underground champers! Are you ready to take a walk through a stunning cave of 2200 square meters? You will meet Dikteon Cave (or Dikteon Andron) up high in Dikte Mount close to Psychro village. Your family guide will lead you to the cave through a beautiful path with breathtaking panoramic views of Lassithi Plateau. Legend has it that Dikteon Andron is the birthplace of the mighty Zeus, the great leader of the Olympian Gods. Unfold the fascinating myths behind his troubling birth and witness the small chamber where baby Zeus was hidden from his ferocious father! Passing through the five champers of Dikteon cave, you will stand in awe of imposing formations of stalactites and stalagmites; you will finally end up to a small lake at the deepest of the cave. Find out about other deities worshiped in the Dikteon Andron since 6000 BC and see for yourself votive offerings along with a built altar that hosted those rituals. You will experience an extraordinary walk through a miracle of nature with great spiritual vibes! When your amazing tour in Dikteon Cave comes to an end, your guide will drive you through small traditional villages around Lassithi Plateau with a long stop at a beautiful Eco-park. You will have the chance to take a taste of the local produce and delicious traditional delicacies, while your children can take a look at rare animals accommodated at the park farm. Relax and hash out your whole Percy Jackson adventure with a wonderful view of Lassithi Plateau. Opt for a pleasant walking tour around the idyllic Rethymno or romantic Chania to complete your experience in Crete; visit the most eminent sites and follow a local guide to the best spots where the Cretan vibe is on! If you are in a more adventurous mood, set sail with a day family-cruise to the islet of Dia. Find out how Zeus and Dia are connected and take a dive to the crystal blue waters of the Cretan Sea!